Wonderful home security for guarding your life! This is a IP Network Camera! 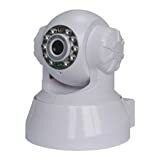 With easy hiding capacity, this camera is most suitable to monitor houses, shops, offices, factories, warehouses, garages, stairways, hallways, etc.